I’ve always wanted to watch an Old Firm Derby, but the fact I’ve never seen one take place is largely my own fault. I was once offered a spare ticket for an SFA Cup semi-final between the two sides at Hampden Park, but declined it on the basis that ideally I would prefer to watch a game at either Ibrox or Parkhead. The second time I was offered a ticket was at very short notice by my good friends from Derry who were flying over for the game at Celtic, but it would have meant time off work that I wasn’t overly enthused about booking for some reason. In hindsight I probably should have taken up the second option, however I suspect my time will come again, and being the slightly masochistic type, in an ideal World it would be a game at Ibrox but I’d go in the away end! The chances of that happening are very slim I suspect. My fascination in the Old Firm stems from my passion for Ireland and its political and religious divides in the North. This of course, rightly or wrongly, comes to the fore during the games between the two sides, and despite valiant attempts to cut out sectarianism and the chanting that goes with it, it simply doesn’t and will not stop. I do find it a bit odd from the outside looking in though, and I guess not being directly affected impacts upon that, but certain aspects of what is, and indeed isn’t tolerated, baffles me. In the crudest of terms, you can hurl abuse at each other about height, weight and hair colour. You can call someone an illegitimate child, you can suggest they over use the right hand, and you can even tell them who and what can be stuffed up the back passage. But, one side is not allowed to sing a song about the Irish being sent on the prison ships to Australia for trying to keep their children alive by stealing corn, and the other side is not allowed to sing about the regalia their forefathers wore at the Battle of Boyne. I guess you have to be one or the other to properly understand, and while I understand to a degree, I don’t really get it? Knaresborough Celtic were formed by Ramsay Beattie, and they play in green and white hoops, yes, I need say no more! 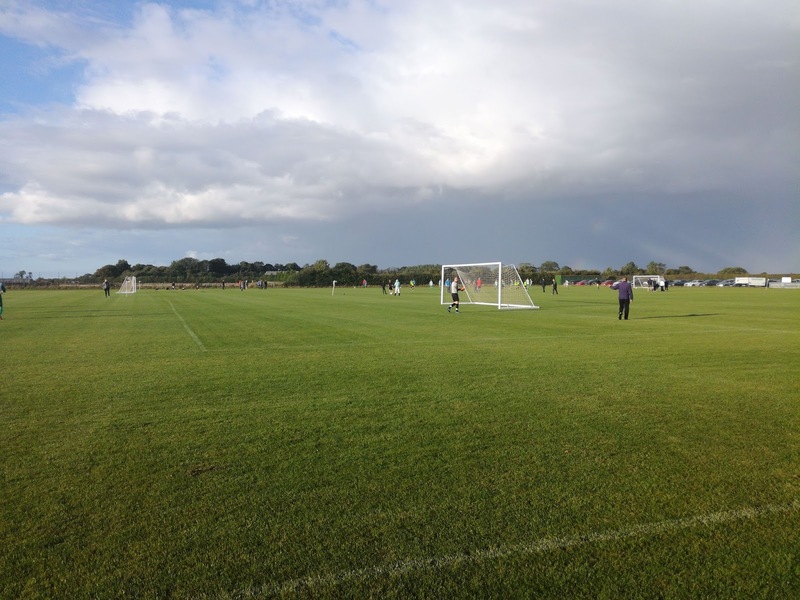 They are very much a community based club who cater largely for the children of the picturesque Yorkshire town. They have acquired an out of town site at Thistle Hill and developed it into a privately owned facility that caters for the clubs many teams. 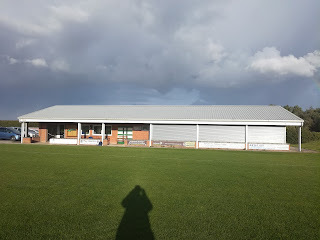 It’s a nice venue, with a long (potholed) drive leading from the main road into the town, and once in the car park you spy a large building that the club built themselves. This building contains dressing rooms, storage areas and a small communal café area. Two full size pitches are located on the site, with other smaller sized pitches alongside. One thing that stood out was the quality of the playing surface, it was absolutely superb, and this was something I told Club Treasurer Andy Nixon who I spent a large part of the game chatting to. Andy gave me a run down on the clubs history, off the field progress and future plans. They are truly a community club, and more importantly they have the personnel and infrastructure, and that is the solid base from which to develop from. 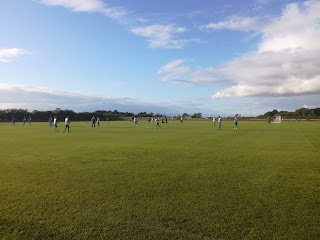 Visiting Kirk Deighton Rangers (in blue) were the opponents, so we did truly have a Celtic v Rangers encounter, and readers of my blog may well recall I visited them in pre-season. 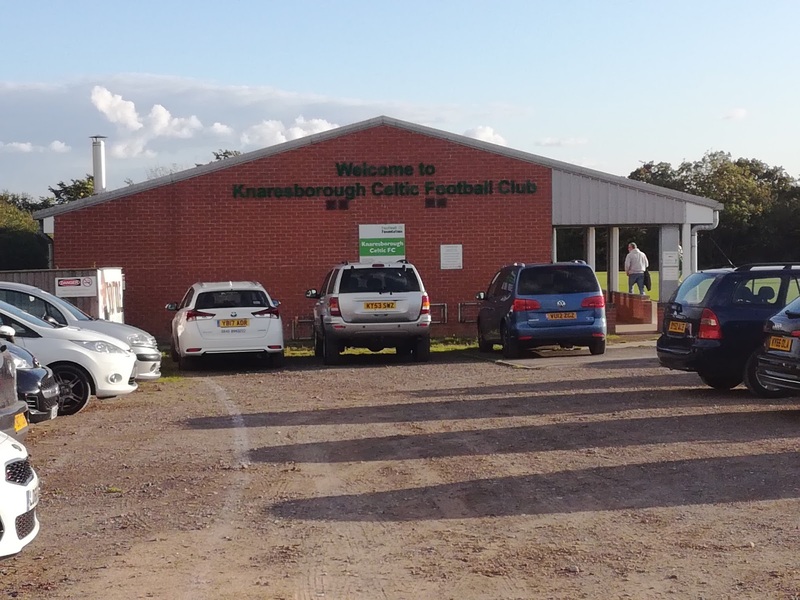 Both clubs have been promoted to the West Yorkshire League this season from the Harrogate League, and from Andy comments, it does appear that Rangers had the upper hand on Celtic last season. So clearly the game, even at this early stage of the season, had something on it, notably due to the history between the two, but also it was a local derby in the sense that Rangers are from nearby Wetherby. The game itself was a cracker. Rangers took the lead from a long range shot that the home ‘keeper lost in the low sun. Celtic fought back though and deservedly found the net twice to reverse the score line. The second half saw Rangers score twice, both from crosses from the right hand side that weren’t dealt with, so they in turn had turned a 2-1 deficit into a 3-2 lead, and if I’m being honest they perhaps didn't deserve it on the balance of play and the number of chances Celtic were creating and missing. Parity was restored to make it 3-3, and from that point on it was Celtic who had the upper hand, but you always felt Rangers, who were a physical side and dangerous from set pieces, had it in them to grab a goal at the other end. Celtic missed a great chance to win it in the dying seconds, but as the light faded the referee ended a thoroughly enjoyable game, one which both sides will no doubt look back on and feel somewhat frustrated, Celtic probably slightly more so. So that was the West Yorkshire Old Firm Derby, and a thoroughly enjoyable experience it was too. No sectarian chanting, no fighting, no flute playing simulations, no flag and banner waving, no Queen, no Pope, just football.